1.1. 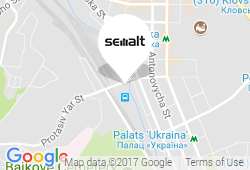 This document is a public offer of Semalt OU - a company having its registered office at Tuukri 19-315, Talinn, Estonia, 10152, providing professional SEO and marketing service hereinafter referred to as «Contractor», and contains all the essential terms of the provision of information and consulting services. 1.3. In case of payment for services, legal entity or individual thereby confirming the adoption and acceptance of the following terms of the Public Offer and becomes the Customer. The Contractor and the Customer are the Parties of the Public Offer. 1.5. In connection with aforementioned, Customer must attentively read the text of this Public Offer and in case of disagreement with the terms and conditions — refuse to conclude the Public Offer and using Contractor’s services. 4.1.1. Organize and ensure the proper provision of services. 4.1.3. Give oral and written consultations on additional issues of the Customer. The amount and timing of counseling, and the form of consultation is determined in each case independently by the Contractor. 4.2.5. To refuse providing services for Customer in the case of non-payment (partial payment) for services in a timely manner, at untimely providing of the application for the provision of services. 4.2.6. To get from the Customer any information which is necessary to perform its obligations under the Agreement. In case of any incorrect or incomplete information which was provided by the Customer the Contractor is entitled to suspend performance of its obligations under the Agreement before providing the necessary information. 4.3.1. Research keywords and phrases to select appropriate, relevant search terms. 4.3.2. Obtaining “back links” from other related websites and directories in order to generate link popularity and traffic. 4.3.3. Editing and/or optimization of text for various html tags, META data, page titles, and page text as necessary. 4.3.4. Analysis and recommendations on optimal website structure, navigation, code, etc. for best SEO purposes. 4.3.5. Recommend, as required, additional web pages or content for the purpose of “catching” keyword/phrase searches. 4.3.6. Hand-submit Customer’s pages to the major search engines and directories. 4.3.7. Create traffic and ranking reports for Customer’s website and any associated pages showing rankings in the major search engines. 4.3.9. Creating high-quality Explainer video based on the one of available video templates. 4.4.1. Timely and fully pay the cost of Contractor’s providing services in the order, in time and in the amount set forth herein. 4.4.2. To provide the Contractor with all the information and data which would be necessary to fulfill its obligations under Agreement. 4.4.3. Do not disclose confidential information and other data provided by the Contractor in connection with the execution of this Agreement. 4.5. The Customer has the right to demand from the Contractor to provide information about the organization and proper ensuring of the Services provision. 4.6.2. Permission to make changes for the purpose of optimization, and to communicate directly with any third parties, e.g., Customer’s web designer, if necessary. 4.6.3. Unlimited access to existing website traffic statistics for analysis and tracking purposes. 4.6.4. All data, documents, content, art or other information needed by Contractor without which Contractor cannot provide services under this Agreement. 4.7. Customer authorizes Contractor use of all Customer logos, trademarks, web site images, etc., for use in creating informational pages and any other uses as deemed necessary by Contractor for search engine positioning and optimization. 4.8. If Customer’s site is lacking in textual content, Customer will provide additional text content in electronic format for the purpose of creating additional or richer web pages. Contractor can create site content at additional cost to the Customer. If the Customer is interested in purchasing content from Contractor, please contact Contractor for a cost estimate. 5.1. The costs of services are determined by the Contractor in invoice in accordance to the rates on the Website semalt.com. 5.2. Payment for Services under this Agreement shall be made on the basis of 100% prepayment and in the manner prescribed by this Agreement. 5.3. The Customer is solely responsible for the accuracy of payments. The moment of payment is considered after receipt of funds to the Contractor’s bank or merchant account. 5.4. Contractor reserves the right to change rates at their discretion. 5.5. Rates indicated for standard services. In case of provision of the additional Services, the value will be increased accordingly. 5.6. Fee for the Contractor’s services is not refundable and does not include the rates of the bank or/and merchant provider. 6.1. Term of services negotiated individually with the Customer and starts to run from the date of receipt by the Contractor of all the required amount of information from the Customer. 6.2. The Agreement ends upon expiration of its duration. 6.3. Customer will be required to make all payments due during the duration of the Agreement. 7.1. By entering into this Agreement, Customer hereby acknowledge and agree that it is expressly subject to all warranties, promises and guarantees given and made by Customer as are set forth in the Terms of Service. 8.1.1. All fees are non-refundable. 8.1.2. All fees, services, documents, recommendations, and reports are confidential. 8.1.3. Contractor has no control over the policies of search engines with respect to the type of sites and/or content that they accept now or in the future. The Customer’s website may be excluded from any directory or search engine at any time at the sole discretion of the search engine or directory. 8.1.4. Due to the competitiveness of some keywords/phrases, ongoing changes in search engine ranking algorithms, and other competitive factors, Contractor does not guarantee #1 positions or consistent top 10 positions for any particular keyword, phrase, or search term. 8.1.5. Google has been known to hinder the rankings of new websites (or pages) until they have proven their viability to exist for more than 6 months. This is referred to as the “Google Sandbox”. Contractor assumes no liability for ranking/traffic/indexing issues related to Google Sandbox penalties. 8.1.6. Occasionally, search engines will drop listings for no apparent or predictable reason. Often, the listing will reappear without any additional SEO. Should a listing be dropped during the SEO campaign and does not reappear within 30 days of campaign completion, Contractor will re-optimize the website/page based on the current policies of the search engine in question. 8.1.7. Some search directories offer expedited listing services for a fee. If the Customer wishes to engage in said expedited listing services (e.g., paid directories), the Customer is responsible for all paid for inclusion or expedited service fees. 8.1.8. Linking to “bad neighborhoods” or getting links from “link farms” can seriously damage all SEO efforts. Contractor does not assume liability for the Customer’s choice to link to or obtain a link from any particular website without prior consultation. 8.1.9. The Contractor is not responsible for changes made to the web site by other parties that adversely affect the search engine rankings of the Customer’s web site. 8.1.10. Customer guarantees any elements of text, graphics, photos, designs, trademarks, or other artwork provided to Contractor for inclusion on the website above are owned by Customer, or that Customer has received permission from the rightful owner(s) to use each of the elements, and will hold harmless, protect, and defend Contractor and its subcontractors from any liability or suit arising from the use of such elements. 8.1.11. Contractor is not responsible for the Customer overwriting SEO work to the Customer’s site. (e.g., Customer/webmaster uploading over work already provided/optimized). The Customer will be charged an additional fee for re-constructing content, based on the hourly rate of 100 USD per hour. 8.1.12. Notwithstanding any other provision of this Agreement, Contractor obligation to provide free SEO services shall cease in the event the Customer’s conduct overwrites the SEO services provided. For example, if the Customer’s webmaster uploads content without consulting Contractor, then Contractor's obligation to provide SEO services for free shall terminate. 9.1. The Contractor and the Customer acknowledge that this Agreement is reasonable, valid and enforceable. 9.2. If any term, covenant, condition or provision of this Agreement is held by a court of competent jurisdiction to be invalid, void or unenforceable, it is the parties' intent that such provision be changed in scope by the court only to the extent deemed necessary by that court to render the provision reasonable and enforceable and the remainder of the provisions of this Agreement will in no way be affected, impaired or invalidated as a result. 10.1. The Contractor reserves the right to modify, update, add, delete, revise and change this Agreement as well as the Terms of Service at any time. Such changes are effective, and Customer agrees to be bound by such changes, by "clicking" the Accept button on the semalt.com Website, or 30 days from the date the changes are posted to the Website, whichever occurs sooner. 11.1. Customer’s claims for the Services provided by the Contractor are taking into consideration within 2 (working) days from the date when the dispute arose and through an email. 11.2. Contractor and the Customer taking into account the nature of the Service provided and undertake in the case of disputes and disagreements relating to the provision of Services to apply the pre-trial procedure for settling the dispute. 11.3. The Parties shall use all reasonable efforts to settle through negotiations any disputes arising out of this Agreement, in connection with it or its violation, termination or validity. 12.1. Parties agree that each shall maintain and not disclose any and all confidential or proprietary information that is received from the other as a result of or in connection with Agreement and/or Services provided in connection therewith. 12.2. Neither Customer nor Contractor will, without the other's prior written consent, disclose to any third party any information concerning the other's proprietary or confidential information and material, including but not limited to the business or method of working of the other party, which may be revealed as a result of or in connection with Agreement and/or Services, except as required by law, to the extent that such information may become public knowledge, may be acquired or generated by either party independently from something other than by a breach of this clause or to obtain legal or tax advice. 12.3. This clause shall survive termination of the Agreement. 13.1. This Agreement will be construed in accordance with and governed by the laws of Estonia. 13.2. For all matters not covered in this Agreement, Parties shall be governed by the laws of of Estonia. 14.1. Headings are inserted for the convenience of the parties only and are not to be considered when interpreting this Agreement. Words in the singular mean and include the plural and vice versa. 14.2. No failure or delay by either party to this Agreement in exercising any power, right or privilege provided in this Agreement will operate as a waiver, nor will any single or partial exercise of such rights, powers or privileges preclude any further exercise of them or the exercise of any other right, power or privilege provided in this Agreement. 14.3. This Agreement will inure to the benefit of and be binding upon the respective heirs, executors, administrators, successors and assigns, as the case may be, of the Contractor and the Customer. 14.4. This Agreement may be executed in counterparts. Facsimile signatures are binding and are considered to be original signatures. 14.5. This Agreement constitutes the entire agreement between the parties and there are no further items or provisions, either oral or written. The parties to this Agreement stipulate that neither of them has made any representations with respect to the subject matter of this Agreement except such representations as are specifically set forth in this Agreement. 14.6. The time of conclusion of this Agreement shall be the moment of payment enrollment to the Contractor’s account. c) fully understands the meaning and consequences of their actions in relation to the conclusion and execution of the Public Offer. 14.8. The Customer has all the rights and powers required for the conclusion and execution of the Public Offer. 14.9. The Customer may at any time unilaterally refuse the Contractor’s Services. In the case of unilateral Customer’s refusal from the Contractor’s Services the payment is not refundable.